What type of art do you create? I make horror sculptures from Polymer clay. not always horror related. I sculpt from photographs of the subject to their design / specifications and seek their approval as the sculpt progresses. I then paint the sculpt with good quality acrylic paint and inks. Where can we admire and purchase your art? You can order directly from my blog, contact me through email or my Facebook link. I can also accept payment via PayPal. 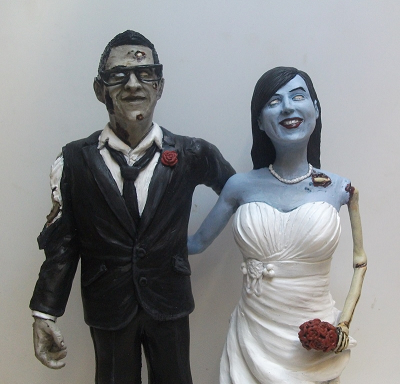 You can also order anything from a Zombie magnet to Wedding Cake Topper through Zombies and Toys website. How did you get into the art field? I've always enjoyed painting and drawing, but I started sculpting about eight years ago. I saw some Superhero busts in a comic book store and was inspired to try from there. (I mix Sculpey firm with regular Sculpey) and I've been continually encouraged by my friends. Selling my work is the biggest thrill and I'm very gracious that I have the opportunity to make items that someone will enjoy for some time. but I'm shortly due to leave and I hope I can turn my artwork into a bigger sideline and start casting sculpts for general sale, fingers crossed. ﻿What was your first creation? I don't have any pictures but it was pretty basic. I've since continued to grow and refine my work and I'm still learning better ways to do things with each sculpt. How long does it take to complete a creation? Each bust takes about a month or so to make. but I guess it takes about 10 -12 hours of work in total for a bust. What was your favorite creation? I really like the 2011 Wedding Cake Topper. They were a great couple to work for and I guess meeting new people is the most enjoyable aspect of my sculpting. keep an eye on the blog for pictures soon. Movies, books, walks in the park. I get sudden rushes of blood and have to get crafting. but I do like it when I get artistic freedom to let rip and make something cool. I'm also planning a H.P. Lovecraft bust soon, that is directly inspired by his great stories. I have three Zombie busts and Zombie Topper for clients. plus a model of a friends son and pet dog. It's good to be busy. I'm also looking to make a Zombie / survivor themed Chess set with Zombies and Toys. Keep at it and keep an objective eye on your work. just so I can reappraise the work with fresh eyes, it does help to spot mistakes. Make sure you do work you enjoy. It's soul crushing to be slaving over a project that doesn't interest you in any way. Lastly and most importantly; Are you ready for the Zompocalypse? Ish? I've made mental notes of where would be a good place to hold up and what would make a good Zombie killing weapon. 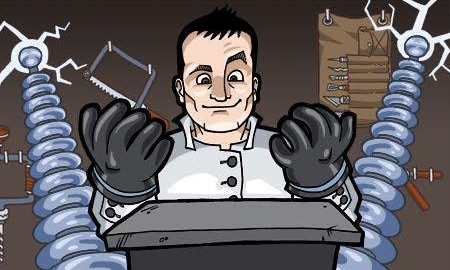 Philip is offering to create a small custom sculpture for one lucky reader! A 50g blob of clay sculpted into anything horror themed your heart desires. Even licensed characters. He'll also add a magnet or pendant loop if you wish. Awesome, eh?! I'd love to win this myself! We'll pick a winner at the end of April. 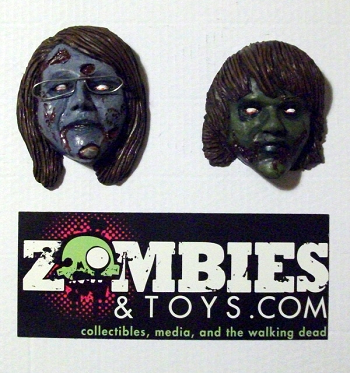 I am a huge fan of Zombies and Philip's insanely brilliant zombie sculpts! I have been following him on Blogger and FB for some time now. I'd love to have a personal bust of moi as a magnet! It would be a (free) dream come true!! Thanks for the chance to win such a killer prize! Enter me please! 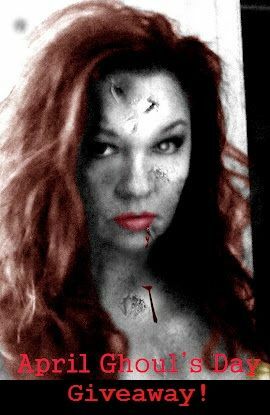 I'd like a bust of the zombie on the cover of "Zombie Housewives of the Apocalypse"
I am already following his blog and now "like" him on FB. He is so talented. I would love to have a sculpture of our zombie housewives. That would be insanely cool. Cool interview, love Phil's work! Interesting interview! Gotta love that zombie cake topper! Oh. My. God. This is awesome. I've been a follower of Phil's for a while and I loved this interview. Great questions. Go Holly. My fav is hearing his advice for aspiring artists "It's soul crushing to be slaving over a project that doesn't interest you in any way." Absodamnlutely. I would love to win the prize! A pendant would be amazing. Honestly, Phil is the artist, so if I win, I'd like to leave it up to him as to whatever he's inspired to do. sponetti at gmail dot com. Thanks Holly! You have a new follower (me!). Thank you so much! I'm following you now too! Good luck to those who entered!